January 14, 2016 – NASA’s Juno mission to Jupiter has broken the record to become humanity’s most distant solar-powered emissary. The milestone occurred at 10 a.m. MST (2 p.m. EST, 19:00 UTC) on Wednesday, January 13, when Juno was about 493 million miles (793 million kilometers) from the sun. The previous record-holder was the European Space Agency’s Rosetta spacecraft, whose orbit peaked out at the 492-million-mile (792-million-kilometer) mark in October 2012, during its approach to comet 67P/Churyumov-Gerasimenko. 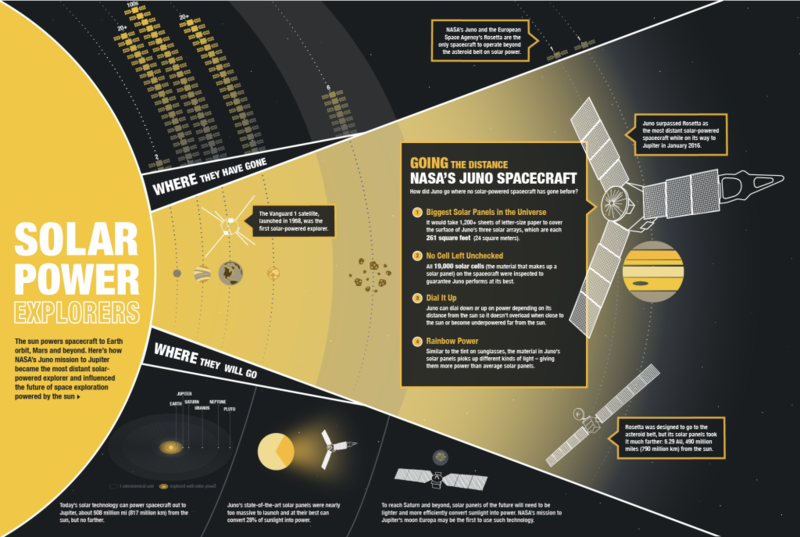 Launched in 2011, Juno is the first solar-powered spacecraft designed to operate at such a great distance from the sun. That’s why the surface area of solar panels required to generate adequate power is quite large. The four-ton Juno spacecraft carries three 30-foot-long (9-meter) solar arrays festooned with 18,698 individual solar cells. At Earth distance from the sun, the cells have the potential to generate approximately 14 kilowatts of electricity. But transport those same rectangles of silicon and gallium arsenide to a fifth rock from the sun distance, and it’s a powerfully different story. Prior to Juno, eight spacecraft have navigated the cold, harsh underlit realities of deep space as far out as Jupiter. All have used nuclear power sources to get their job done. Solar power is possible on Juno due to improved solar-cell performance, energy-efficient instruments and spacecraft, a mission design that can avoid Jupiter’s shadow, and a polar orbit that minimizes the total radiation. Juno’s maximum distance from the sun during its 16-month science mission will be about 517 million miles (832 million kilometers), an almost five percent increase in the record for solar-powered space vehicles. 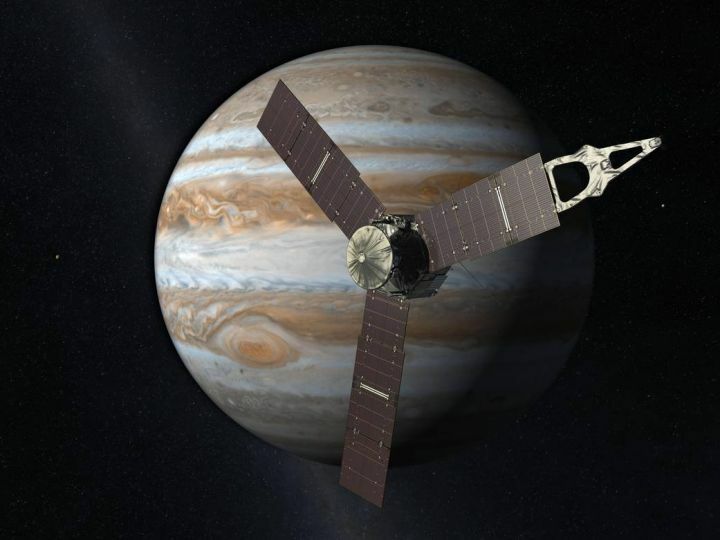 Juno will arrive at Jupiter on July 4 of this year. Over the next year the spacecraft will orbit the Jovian world 33 times, skimming to within 3,100 miles (5,000 kilometers) above the planet’s cloud tops every 14 days. During the flybys, Juno will probe beneath the obscuring cloud cover of Jupiter and study Jupiter’s aurorae to learn more about the planet’s origins, structure, atmosphere and magnetosphere. NASA’s Jet Propulsion Laboratory, Pasadena, California, manages the Juno mission for the principal investigator, Scott Bolton, of Southwest Research Institute in San Antonio. Juno is part of NASA’s New Frontiers Program, which is managed at NASA’s Marshall Space Flight Center in Huntsville, Alabama. Lockheed Martin Space Systems, Denver, built the spacecraft. The California Institute of Technology in Pasadena manages JPL for NASA.